Without synthesizers, flashy stage props and an army of musicians, singer/songwriter/multi-instrumentalist Steve Winwood is sounding and looking, in the words of Billy Crystal, marvelous these days. The Rock and Roll Hall of Famer brought his four-piece band March 3 to Paradise Cove inside River Spirit Casino in Tulsa, Okla., and the 110-minute gig stretched across Winwood’s unique, exceptional musical career both with ease and edge. The playing chops of Winwood and his musical compatriots never dipped below grade-A territory in front of the attentive, near-capacity audience. Winwood’s soulful, Ray Charles-esque singing voice retained pretty much all its tone and power originally heard on those terrific singles and album cuts Winwood originally made with his bands Traffic, Spencer Davis Group and the short-lived super group with Eric Clapton and Ginger Baker, Blind Faith. 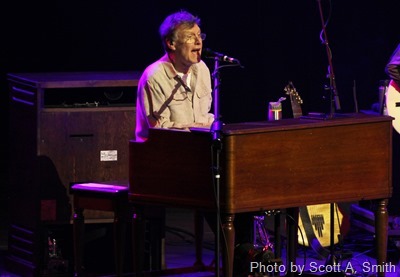 Part of Winwood’s current Greatest Hits Live Tour, the Tulsa show saw many of the Winwood’s songs, including the brilliantly placed, one-two punch of Blind Faith’s “Can’t Find My Way Home” and “Had to Cry Today,” garnering standing ovations . There was a lot of great sound coming from just five musicians on that Tulsa stage — six musicians if you count Winwood’s daughter, Lilly, who stepped onto the stage late in the set to add impressive harmony vocals to 1988’s hope-seeking “Roll With It” and the haunting, acoustic-based traditional favorite “John Barleycorn (Must Die).” Drummer Richard Bailey certainly gave one of the greatest drum performances this writer has witnessed. The acoustic sounds of his drums and cymbals could be heard plain as day from the center of the third row, as could the equally magical percussion work from Edwin Sanz. The efforts of Bailey and Sanz never trampled over each other, but instead, they blended seamlessly into one infectious sound that took on heavy elements of rock, funk, jazz, Afro-Caribbean and Brazilian music. Also sharing the stage were Jose Neto (guitar) and Paul Booth (saxophone/flute/keyboards, both also are no slouches on their respective instruments. It’s easy to see and hear why Winwood, who was inducted into the Rock and Roll Hall of Fame as a member of Traffic in 2004, chose all of the members of his current solo band. Not only could Winwood’s team players keep up with Winwood in Tulsa, but they clearly motivated him. Making the list of the evening’s highlights was Winwood’s take on Traffic’s “Low Spark of High-Heeled Boys.” Possessing a slow-burn, almost-soothing rhythm on the verses and assertive-yet-melodic sonics on the chorus, “Low Spark of High-Heeled Boys” merged quasi-psychedelic atmosphere with jazz sounds and more. “Higher Love,” “Gimme Some Lovin'” and “Pearly Queen” also found their way into the Tulsa set, as did a note-perfect run-through of Buddy Miles’ “Them Changes.” Propelled by peppy rhythms, “Them Changes” was a fitting choice for Winwood’s strong voice and the dexterous skills of his group. As great as Winwood sounded on organ, he was downright on fire on lead guitar. Need proof that he can stand toe to toe with Eric Clapton in the guitar-soloing department? Go see Winwood in concert now and you’ll be bathed in aural example after example. Winwood’s fingers were ferocious across the neck and pickups of his beloved, green-colored Fender Stratocaster on “Dear Mr. Fantasy,” where the Traffic staple temporarily became a showcase for Winwood’s six-stringed abilities. Winwood bent guitar notes into emotional areas, often letting his right hand strum feverishly in a way that would make Buddy Guy and The Who’s Pete Townshend proud. Yet Winwood’s time-stopping guitar playing never shoved his band mates into the background. Whenever Winwood’s electric guitar sound would build in intensity, the sounds of Winwood’s musicians were right there at the forefront. The Tulsa show was ensemble playing at its very finest. Not a single note was out of place, nor was there ever a single bar of music that back-peddled into look-at-me showiness. There wasn’t even one chirp of microphone feedback to be heard. Those who sat in that comfortable, darkened theater were treated to the sounds and sights of gifted musicians who did what all groups should always do — Winwood and company truly listened to each other while playing, only asking the audience to roll with it. And those fans absolutely did just that.